Hi guys, today we’ll talk about some very simple but powerful technic that we always use in our integrations. Its joins two concepts together and make our lives a lot easier and our integration a lot more dynamic. We are talking about variables and the concept of “Global” parameters. In our integrations we never, ever have anything hard coded. Every time you hard code something it will come back to bite you in the future that is for sure. 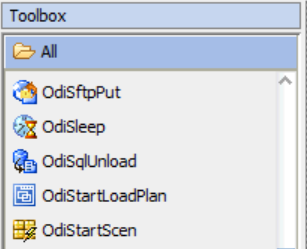 Then the first thing we do in a project is to create a table that we call ODI_PARAMETER. This table will contain all configuration and parameters that needs to be validated, hard coded and so one. The “SESSION_NM” is used to make the variable reusable in all scenarios that we want, meaning we’ll have only one variable for packages in the project or even for all projects (if we make this variable global in ODI). How it works? 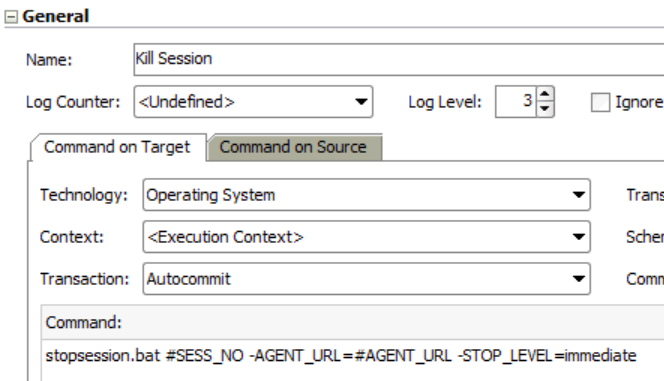 First of all we need to get the “Session Name” for our “Scenario/Package”. 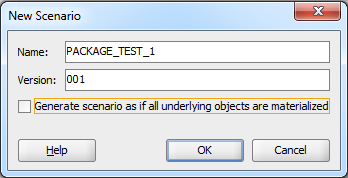 Why did I say “Scenario/Package”? 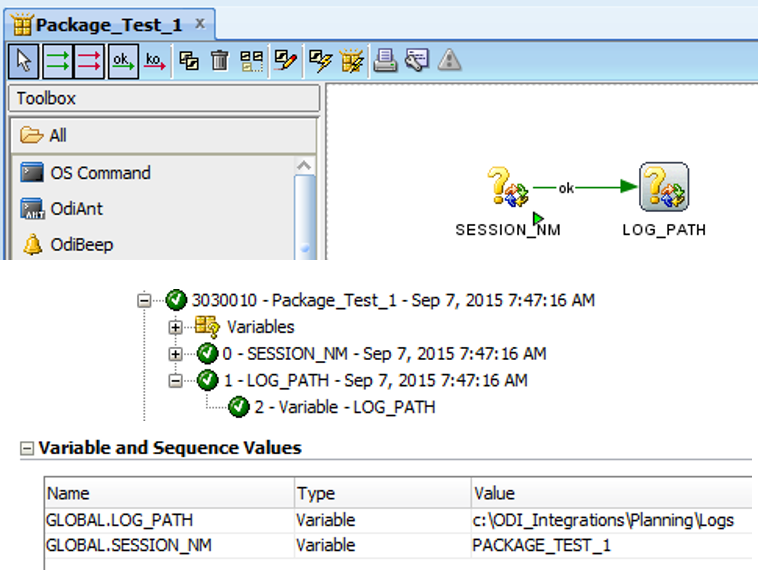 Because the result could change depending if you are running a Scenario or a Package. Let me explain this. 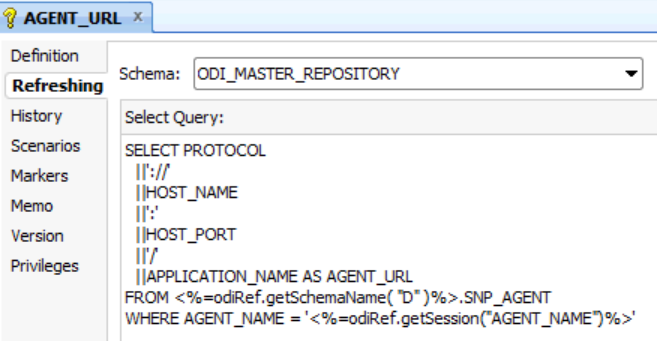 To get the “Session Name” in ODI we use an ODI Substitution method called “odiRef.getSession”. 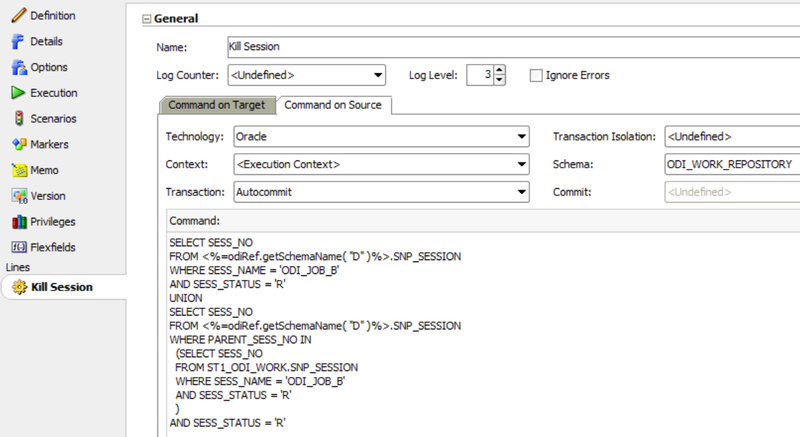 This method has other parameter that could return the Session ID, and other stuff but what matters for us is the “SESS_NAME” parameter, that will return the name of the session, the same thing that appears in the operator when we run any object in ODI. Why I said object? 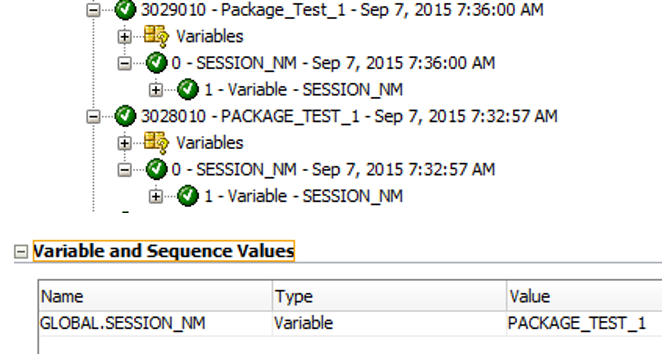 Because if you run a variable the session name will be the variable name. 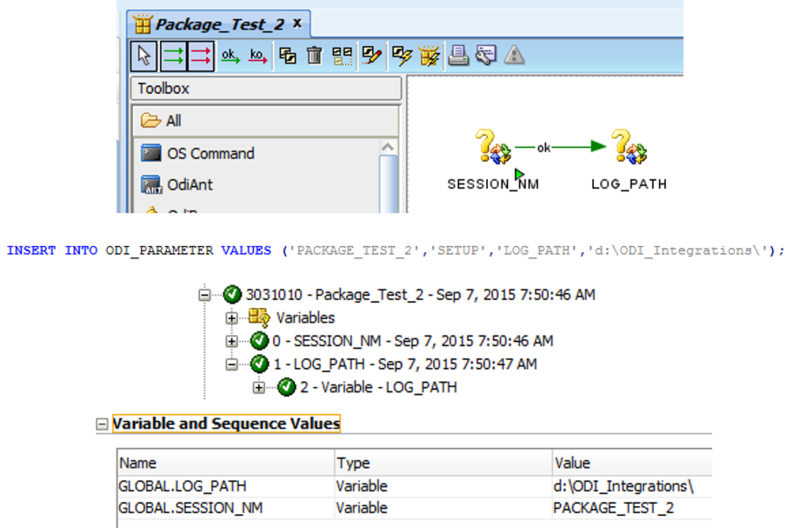 If you run an interface, the session name will be the interface name, it goes to procedure, package and scenario, and that is why I separate the “Scenario/Package” because if we do not pay attention, the name of the package would be different of the name of the scenario, causing a problem when we run one of them. Meaning, if we will use the result of this variable as a way to return data from a table, we’ll have a problem because it’ll not find the same result if you run the package or the scenario of that package. 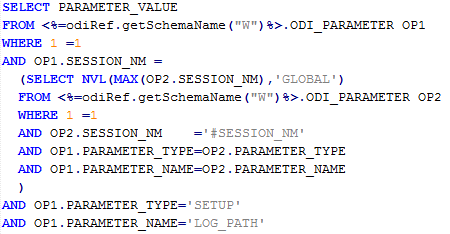 The easiest way to resolve that is to have the name of the main scenario (the scenario that will contain all the other scenarios) with no spaces and no special characters (ODI also transform special characters like % in to _). Now we have the same results if we run the package or the scenario. See, same code, two different results. That means, 90% of the interfaces needs just to be duplicated and the parameters in ODI_PARAMETER needs to be inserted for the new interface and it is done. Also, we don’t need a ton of variables to get different results. And there is more. The code of the variable also does not change that much. 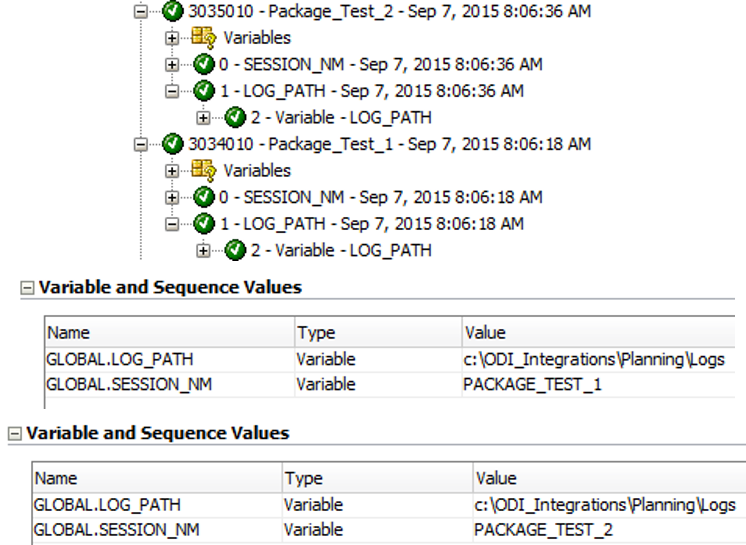 For a new variable, we just need to duplicate the LOG_PATH variable and change the PARAMETER_TYPE, PARAMETER_NAME and PARAMETER_VALUE to get any other information from the ODI_PARAMETER. That means, easier to maintain. This would make the LOG_PATH equal for all integration right. 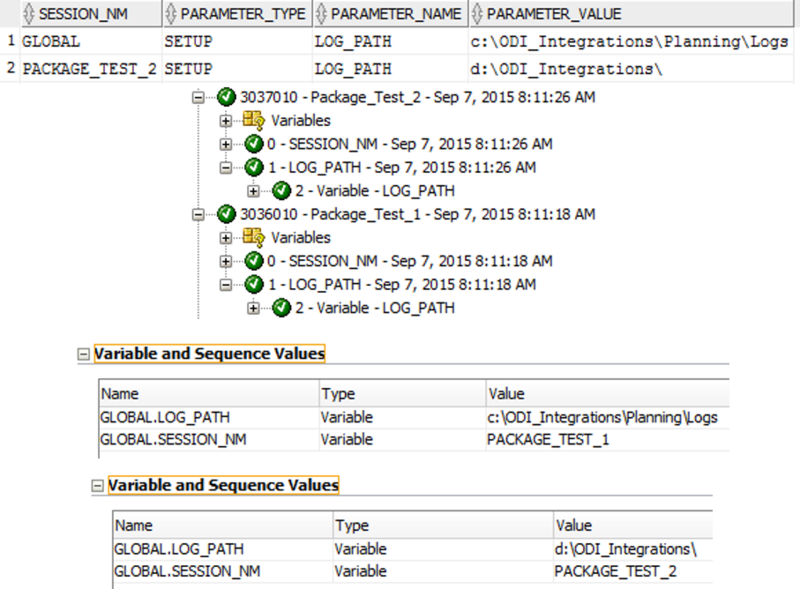 Nevertheless, in the way we create our variables we will need to insert one line for each integration in our ODI_PARAMETER table right. This will guarantee that you never ever needs to touch your code again to test or change anything that the business ask you for. As I said, is a simple but very powerful tool to use. Hope you guys enjoy and see you soon.